Villa Loris is a two bedroom villa built in 2 acres of private grounds providing a private shoreline for guests and an amazing serene environment. 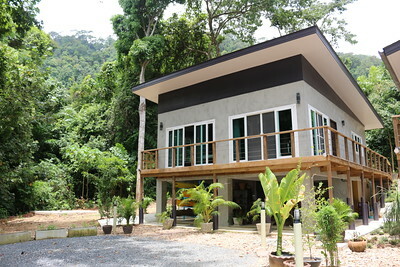 The villa is part of a small complex with only 3 villas, two villas are for rent and the third villa is where the management team sleep. All villas sit back and face out to the sea offering private rooms with stunning views. Although the villas are private in every sense you may interact with other guests in the villa grounds. The Villa Loris is a two bedroom villa and enjoys aircon in every room, there is also an option of using fans or you can let the cool breeze in, every door and window is fitted with screens. Both bedrooms offer homely furnishings, wardrobe and drawers. 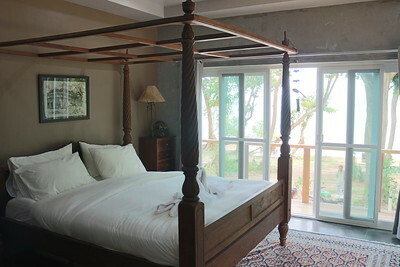 The front bedroom has a four poster bed offering sea views. Here you can lie in bed and watch the sunrise over the surrounding islands. 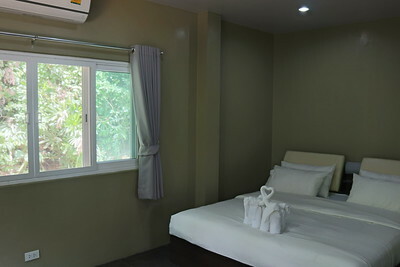 The back bedroom also enjoys a double bed but only has forest views. 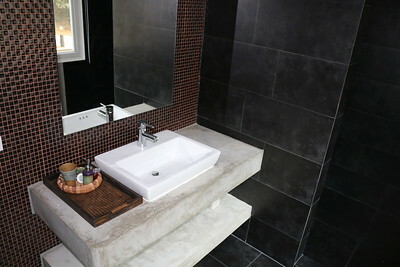 Both bedrooms share a very spacious bathroom which is situated between the rooms. 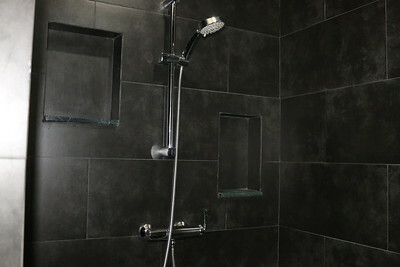 In the bathroom is a hot water shower, western toilet, washbasin with large vanity mirror and sockets for shavers. Bathroom essentials provided include shampoo, soap and fresh towels. 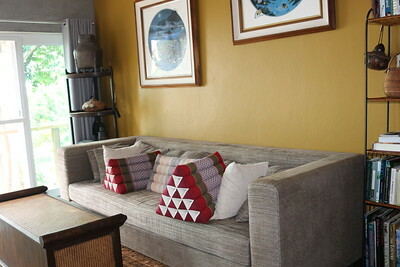 At the front of the villa is a lounge area, if there are 5 guests the sofa can be used as another option to sleep on. The kitchenette is set along one wall with microwave, fridge, washing facility, utensils, tableware and a cold water drinking machine. 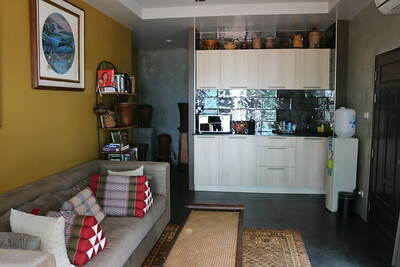 If you want more space to cook a large gourmet kitchen is available upon request in the manager’s villa. For those not wanting to cook as you are on holiday you do have an option of breakfast – this does have an additional fee and the manager can explain the options when you arrive. 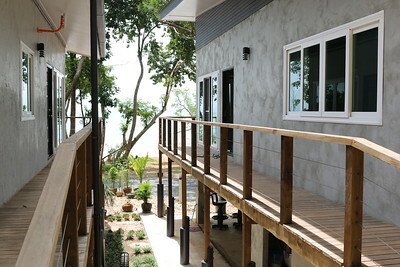 The villas are built above the ground with tables and chairs allowing you to relax or eat outside. This is good area as it cooler in the day time. The sea is only 30 meters away – you have an option of swimming or using the free kayaks. The grounds have specially designated seating and lounging areas in between the trees and along the sea front also for you to enjoy. Villa Loris design and tranquil location are perfect for couples, families and friends wanting to relax, unwind and escape. The location is far south on the east coast – this area is not as developed as the west coast where all the tourist beaches and hotels are. If you want to get around the island and go out from the villa. Bicycle, motorbike or even car rental can be provided when you arrive from the villa manager. If you are not comfortable with driving they can also help provide Local transport services.